TUMEKE! : Why did the chicken cross the road? To spread bloody bird 'flu everywhere, apparently. 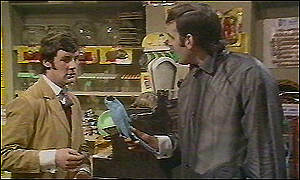 The Dead Parrot Sketch, Monty Python. Customer: (sniffling) 'Ello, I wish to register a complaint. C: I'm sorry, I have a cold - something I think I got from the bird - I wish to make a complaint! O: Oh yes, the, uh, the Norwegian Blue...What's, uh...What's wrong with it? C: I'll tell you what's wrong with it, my lad. 'E's dead from bird 'flu, that's what's wrong with it! C: Look, matey, I know a dead parrot with H5N1 when I see one, (coughing) and I'm looking at one right now. O: No no he's not dead, he's, he's restin'! Restin' from a mild belt of the common avarian cold... ahh, H5N2 the ahh, good one. Remarkable bird, the Norwegian Blue, idn'it, ay? Beautiful plumage! O: Nononono, no, no! 'E's resting! - sign of a healthy bird recovering from a normal, everyday cold... sort of like yours. C: (yelling and hitting the cage repeatedly) 'ELLO POLLY!!!!! Testing! Testing! Testing! Testing! Wakey, wakey you diseased pathogenic vector. This is your nine o'clock alarm call! O: Yeah! You stunned him, just as he was wakin' up! Norwegian Blues stun easily when they're getting over the common cold, major. C: Um...now look...now look, mate, I've definitely 'ad enough of this. (dizzy misstep) That parrot is definitely deceased, and when I purchased it not 'alf an hour ago, you assured me that its coughing and spluttering was due to it mimicing a previous owner with a lisp and terrible enunciation. O: The Norwegian Blue prefers to recuperate on it's back! Remarkable bird, id'nit, squire? Lovely plumage! O: Well, o'course it was nailed there! If I hadn't nailed that bird down, such was the insignificance of its ailment, it would have nuzzled up to those bars, bent 'em apart with its beak, and VOOM! Feeweeweewee! C: 'E's not pinin'! 'E's passed on! This parrot is no more! He has ceased to be! 'E's expired and gone to meet 'is maker! 'E's a stiff! Bereft of life, 'e rests in peace! He's a World Health Organisation statistic! If you hadn't nailed 'im to the perch 'e'd be pushing up the daisies! The only thing living in him is the mutating 'flu virus! 'E's off the twig! 'E's the bird formerly known as a parrot! O: No Governor all I got left alive is - and this is all new stock fresh in mind you - is a Romanian swan, a racing pigeon from Canada, a couple of Vietnamese Chickens, a Turkey from the Greek Islands and half a dozen ducks from China; but I'm all out of parrots... (pause) or you can buy what all my customers are crazy for today - big seller, very popular with your distressed bird fanciers. C: (projectile vomits across entire shop, wipes residue from mouth and chin, regains composure) What would that be then? O: A packet of Tamiflu for £199. C: Better make it two packets. Our biosecurity is a shocker - and it can't be all of Boo-boo's fault. The Didimo threat - I have heard a lot of noise about preventing the spread within the South Island but nothing about how and why it got here in the first place and preventing it occuring again. That is just as important isn't it? On DW TV I saw a report that said the German coast is now infested with New Zealand barnacles. So that's our quid pro quo for the sea squirt I suppose. Lovely. I bow before you.